Well over a year into the Trump administration, in the face of historically low unemployment levels and a stock market (as we often hear about through the POTUS Twitter account) hitting new all-time highs, how can anyone excuse a $1.5 trillion increase in the national debt during these, putatively the best of economic times? Internal financial alarms sound by the day, and here’s yet another red herring that demonstrates just how broken the markets are right now. The sell-off that began on January 29th spanned ten trading days and took the S&P500 down 10.2 percent (11.8 percent from intraday high to low), and was the first correction this century that corresponded with a rise in the 10-year Treasury yield. That is a positive correlation between stocks and bonds to the downside during an official correction. 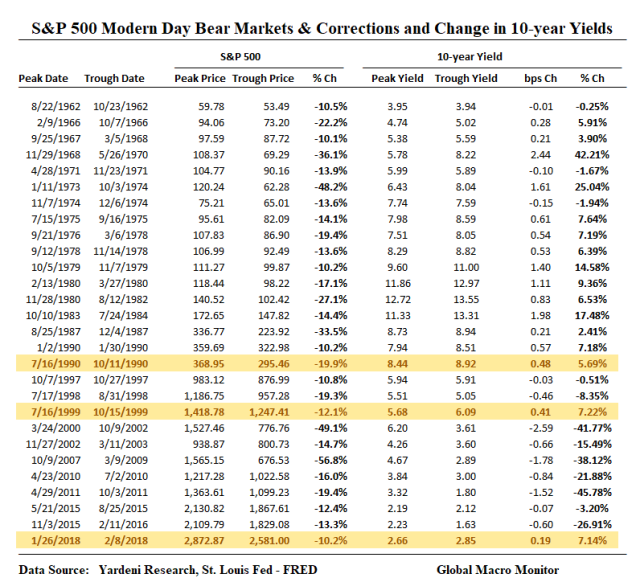 Moreover, this table shows there has been only one other correction or bear market in almost 30 years that has seen the 10-year Treasury yield rise. The correction in 1999 and 41 bps move higher in bond yields was the result of the Fed and market yields rebounding from the sharp drop and overshoot in interest rates during the Russian debt default and LTCM crisis in 1998. Excluding 1999, a special case, in our opinion, the recent correction was the first that has experienced a simultaneous rise in bond yields since 1990. Before February for almost 30 years, bonds have rallied during every stock market correction as a “flight-to-quality” trade.